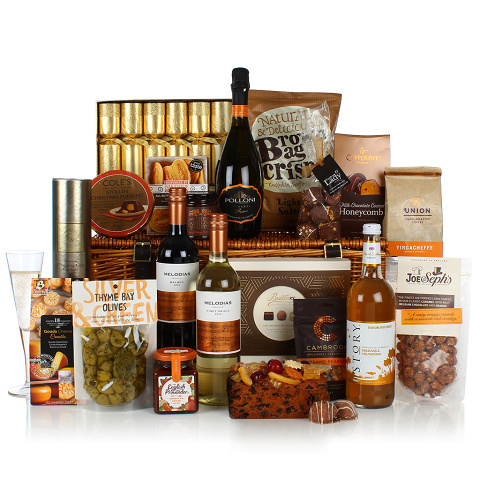 Send Christmas in a basket straight to your recipient's door with this classic hamper, packed with all those luxurious Christmas treats. We've included plenty of sweet and savoury options as well as plenty of Christmas tipple! A wonderful, decadent choice for Christmas. Buiteman Gouda Crumbles 75g ? Butlers Assortment of Chocolate Truffles & Pralines 185g ? Cambrook Brilliantly Caramelised Sesame Peanuts 80g ? Coles Stollen Christmas Pudding 454g ? Copperpot Milk Chocolate Coated Honeycomb 100g ? Grandma Wild's Luxury Chocolate Chip Biscuits 150g ? The English Provender Co. Moroccan Spiced Chutney 300g ?